The Spider Financial Blog is your source for insights, updates and user tips from our team of experts. Whether you’re a quant, statistician, trader, risk manager, portfolio manager or other financial professional, the Spider Financial Blog can help you stay current on the trends and strategies you need to know about. En este lanzamiento, hemos modernizado las funciones de suavizado exponencial de NumXL y creado un nuevo optimizador para encontrar óptimos parámetros de suavizado; combinando los mejores algoritmos estocásticos y computacionales de búsqueda. Además, la función de suavizado devuelve una sección más amplia de tipos de resultado: fuera de la muestra, valores óptimos para parámetros de suavizado, nivel/tendencia/estacionalidad y series de componentes de pronóstico dentro de la muestra. Finalmente, hemos introducido una nueva función para soportar todos los tipos de tendencia y/o componentes estacionales para capturar más de 10 modelos de suavizado exponencial adicionales más allá de nuestro conjunto original, incluyendo el modelo simple de Brown, el modelo linear de Brown, el modelo doble de Holt y las funciones de suavizado exponencial multiplicativo de Holt-Winters. En esta versión, hemos adicionado una categoría completamente nueva para las medidas de comportamiento de pronóstico, una clave métrica no sólo para comparar diferentes modelos de pronóstico entre una a múltiples series de tiempo, sino también para cuantificar y rastrear las capacidades del proceso de pronóstico a lo largo del tiempo. Hemos escogido más de 15 medidas usadas ampliamente en esferas académicas y en la práctica tales como; Error Cuadrático Medio (MSE), Error Porcentual Absoluto Medio (MdAPE), Error Absoluto Relativo Medio (MRAE), Error Escalado Absoluto Medio (MASE) Mejor porcentaje (PB) y otras. También hemos expandido nuestra soporte de documentación en línea y ahora incluimos más notas técnicas y tutoriales en Español. La idea de estas actualizaciones proviene de ustedes. Como siempre, nuestro objetivo es hacer que el análisis se procese mejor, entregándoles las herramientas necesarias para que puedan responder las preguntas que tengan sobre sus datos. May 15, 2017: We are excited to announce the release of the latest version of NumXL 1.65 (HAMMOCK). In this release, we have revamped the NumXL exponential smoothing functions and created a new optimizer for finding optimal smoothing parameters, combining the best stochastic and computational search algorithms. Furthermore, the smoothing function returns a larger selection of output types: out-of-sample, optimal values of smoothing parameters, level/trend/seasonal, and forecast in-sample components series. Finally, we introduced a new function to support all types of trend and/or seasonal components to capture over 10 additional exponential smoothing models beyond our original set, including Brown’s simple, Brown’s linear, Holt’s double, and Holt-Winters multiplicative exponential smoothing functions. In this version, we have added a whole new category for forecasting performance measures, a key metric not only for comparing different forecasting models within one (or multiple) time series but also for quantifying and tracking forecast process capabilities over time. We have chosen over 15 measures used widely in academic spheres and in practice, such as mean squared error (MSE), median of absolute percentage error (MdAPE), mean relative absolute error (MRAE), mean absolute scaled error (MASE), percentage better (PB), and others. We have also expanded our online support documentation, and now include more Spanish technical notes and tutorials. The idea for these updates came from you. As always, we aim to make the analysis process better by providing you with the tools you need to answer more of your data questions. For a complete list of the changes, please refer to the NumXL 1.65 release notes. We are excited to announce the release of the latest version of NumXL: 1.64 (TURRET). In this release, we have revamped the NumXL program and support resources to fully-support multiple languages. Currently, we included Spanish, and additional languages (e.g. Japanese, Korean, Chinese, etc. ), which are planned for future releases. The additional languages will help our non-English speaking users utilize NumXL to its fullest. In addition to many fixes, we have significantly expanded the output documentation for each generated report in Excel to better describe and explain the calculation in tables and charts to help you make sense of your analysis. We’ve also added a new functionality called Periodogram. Our Periodogram function will help you calculate the significance of different frequencies in time series data to identify any periodic signals if there are any. Lastly, we have made a few key enhancements to the installation and license activation process. For installation, the program will now run for users with non-administrative privileges, prompts fewer screens and steps, and quickly sets up the NumXL add-in. For the license activation, we automated the subscription renewal process, so that NumXL would detect changes in the subscription status (e.g. renewal, cancellation, etc. ), alert the user, and then automatically update the license information stored in user’s machine. The idea for this update came from you, the customers. As always, we have just made the analysis process better by providing you with tools that would answer your questions about the data. Check out a video below that shows some of the features of NumXL 1.64. For a complete list of the changes, please refer to the NumXL 1.64 release notes. There are several block sites that are using our name NumXL and offering a free cracked version of our software. Please note that these sites are not affiliated with NumXL and often times their downloads contain malware and viruses that can harm your machine. In addition to the student discount, NumXL now offers classroom site licenses. NumXL has several different pricing options to suit your needs regardless of classroom size. Check out our Academic Discount Program here. Windows XP, Windows Vista, Windows 7, Windows 8, Windows 10 or later is required to run NumXL. Mac users can use NumXL by installing a virtualization software to run Windows on a Mac. We currently support the following virtualization software: VMWare, Microsoft Virtualization, and XEN. We have just posted a new hot-fix (1.63.42296.1) on our website to address the compatibility issue of NumXL with Excel 2016 (32 and 64-bit). Please, download this version and update your NumXL installation. Aside from the Excel 2016 compatibility issue, there are no major changes between this update and prior ones. We are excited to announce the availability of NumXL SDKi 1.63! The NumXL software development Kit (SDK) allows users to develop custom statistical and econometric applications for Microsoft Windows. You can download the SDK directly from GitHub for free! There is absolutely no cost for using the SDK in your custom applications, yet every new user of your application would require a NumXL license from us, which means we only make money when you do. An important question posed in development projects is, should I use a 3rd party library or build my own? At Spider Financial Corp, we are specialists in statistics and econometrics, which would save you the trouble and cost of hiring specialists in that field. We also add value by saving your time and effort of writing the code. Even though you might not have total control on development, NumXL is well tested and has proven quality. And the cherry on top is that it’s completely free. NumXL SDK supports a variety of development environments including C/C++, .NET, and VBAi. June 5, 2014: We are excited to announce the release of the latest version of NumXL: 1.63 (SHAMROCK). In addition to many fixes, the new version now thoroughly supports new ARMAi-type models (e.g. ARIMAi, Seasonal ARIMA, ARMAX, and SARIMAi-X) and time series (Monte-Carlo) simulation. With this update, NumXL will greatly streamline the process of creating robust ARMA/ARIMA models for everyday use with just a few easy clicks. NumXL 1.63 will also add two new models (ARMAX and SARIMAXi) to your factors analysis arsenal to help you get a handle on regression cases with correlated residuals. Furthermore, the new simulation functionality lets users conduct all sorts of ad-hoc scenarios and calculate sound statistics to further support their decision making processes. Finally, the new version's improved functionality will help us make strides towards developing model detection and diagnosis functionality. This means we’ll soon offer various automatic model detection methodologies (e.g. Box-Jenkins), backtesting, and others. Check out a video below that shows some of the features of NumXL 1.63. For a complete list of the changes, please refer to the NumXL 1.63 release notes. In an ongoing effort to fight spam, Spider Financial will no longer accept one-time (temporary/disposable) email addresses for any use: user's account registration, license request, support request, feature request, comment posting, etc. Spider Financial is committed to protecting your privacy and developing technology that gives you the safest and most powerful online experience. The Spider Financial Privacy Statement applies to Spider Financial's website and governs data collection and usage at this site. Single-User License: You as an individual can now install NumXL on an unlimited number of computers to which you have an access. Transferable License: You may permanently transfer NumXL license to another individual. For full details, please check the end-user agreement online. These changes were inspired by our customers and in response to numerous inquiries we received over the years from users trying to install NumXL on a secondary computer or notebook. We recognize that power users access a wide range of devices and might wish to use NumXL on all of them with little or no additional financial burden. What does this mean to new users? New customers will enjoy the flexibility offered by the new EULA and may install NumXL on all their computers for their exclusive use. How does this affect existing customers? The new EULA supersedes the prior ones and thus, existing customers can now install NumXL on an unlimited number of computers for their exclusive use. They may permanently transfer their NumXL to another individual. What about users with multiple license keys? In the past, we responded to customers’ inquiries about installing NumXL on a second machine by issuing a second license free of charge to accommodate their needs. Going forward, the issued licenses (mentioned above) will be voided and customers should use the license key acquired during his/her purchase of NumXL. After receiving several inquiries about the exponentially weighted moving average (EWMAi) function in NumXL, we decided to dedicate this issue to exploring this simple function in greater depth. November 25, 2013: We are thrilled to announce the release of the latest version of NumXL: 1.62 (DEWDROP). In addition to many fixes, the new version includes a user interface (aka Wizards) for the Johansen test for cointegration, Baxter-King (BK) filter and convolution operator, along with a new software development kit for VBAi. The ideas for this update came from you, our customers. As always, we strive to make your regression and statistical testing better by providing you with the right tools to fit your data. For a complete list of the changes, please refer to the NumXL 1.62 release notes. With NumXL 1.62, you will be able to perform Johansen test for cointegration, convolution and Band-Pass filtering with Baxter-King (BK) filter through a simple, user-friendly interface. You will be able to answer the question of cointegration among your input variables through few clicks away. Furthermore, we added another commonly used filter for macroeconomic data - Baxter-King (BK) to our spectral analysis toolkit. Furthermore, the NumXL SDK for VBA is included with this release. The NumXL SDK for VBA is a set of sophisticated econometric and statistical functions that you can call from your macros to perform any level of automation you see fit. After the completion of beta testing, NumXL 1.62 will be officially released. There have been several inquiries since the time we released our first entry on DFT, especially about using the DFT components to represent the input data set as the sum of the trigonometric sine-cosine functions. The inquiries were motivated by using this representation to interpolate intermediate values, and possibly extrapolate (aka forecast) beyond the input data set. We prepared the second entry on DFT to tackle those inquiries in more depth, and to clarify few misconceptions. More details can be found here. [July 15,2013] Today, the NumXL team announces the launch of the semi-annual licensing (aka subscription) program for NumXL 1.6X Pro. New customers can now choose between the perpetual licensing plan, annual licensing subscription and the semi-annual subscription at a lower cost. The semi-annual license includes FREE premier support and updates, along with the same discounting for volume, non-profit, government and academic organizations. A semi-annual subscription of NumXL is available at a base price of $110/user/6-month, while the annual subscription is available for $200/user/year and the perpetual license is available for $500/user. In this white paper, we will not delve into the theoretical economics behind the price changes or their spreads. Instead, we will examine the daily prices of the first four (4) contracts of WTIi CLi futures listed on NYMEXi. Next, using exchange rules for WTI/CL contract trading, we will compute the number of days to the delivery month for each contract to construct the futures curve. Finally, we will carry out principal component analysis (PCAi) in an attempt to uncover the core drivers behind the futures curve changes. Why do we care? The oil future market is very complex in its design, and, in this paper, we will attempt to uncover and simplify the underlying drivers reflected in the daily relative prices of different contracts for a better understanding and better hedging for a portfolio of such instruments. July 2, 2013We are excited to announce a new change to our online order system: we have switched our payment processor to Fast Spring (Santa Barbara, CA USA). Using Fast Spring’s simple yet secure shopping cart system, we are able to offer NumXL all over the world, in languages and currencies automatically localized to each customer, while fully complying with local tax laws and regulations. Furthermore, more payment methods (e.g. purchase order (PO)), etc.) are now available to you. How does this affect our customers? Fast Spring is now considered our vendor of record, so invoices are issued by Fast Spring and charges will appear on your bill as: FS* spiderfinancial. Aside from that, Spider Financial stands behind each sale made on its behalf. We continue to provide an unconditional 30-day money back guarantee for all purchases, and to offer the same discount programs (e.g. student, non-profit/academic, or volume). For more details, check out our online sales policy. June 20, 2013: We are happy to announce the release of the latest version of NumXL 1.61 (BOLAS). In addition to many fixes, the new version includes a user interface (aka Wizards) for empirical distribution function (EDFi), Kernel density estimator (KDEi) and Discrete Fourier Transform (DFTi). For a complete list of the changes, please refer to the NumXL 1.61 release notes. In this case study, we examine closely the highway retail price ($/Gallon) for "No.2 Ultra Low Sulfur (0-15 ppm) Diesel" in the EIAi nine (9) PADD regions. We carry on principal component analysis in an attempt to find a minimal subset of the principal components that capture (or explains) the variation (spreads) in prices across different regions with a minimal loss of information. Why do we care? Developing a solid understanding of the principal component analysis and the interpretation of results will become a cornerstone in risk management, portfolio allocation, and hedging applications. [June 5, 2013] This is our third installment in an ongoing series of demonstrating select case studies. We'll use real financial data to construct models with the help of NumXL. In this paper, we discuss the capital asset pricing model (CAPMi) underlying assumptions, define systematic and idiosyncratic risk, and outline their implication on the covariance among assets. Afterward, using a simple regression model, we compute the CAPM sensitivity factor (beta) for two different tech stocks: Microsoft and IBM. This paper will pave the way for more advanced factor modeling techniques in upcoming tutorials. Why should you care? CAPM is a widely used and often quoted model in finance and trading. Developing a solid understanding of the theory, the implication on covariance matrix, and the practical issues encountered during its parameters' values calculation will prove to be a corner stone in risk management and portfolio performance attribution applications. With NumXL 1.60, you will be able to perform principal component analysis, a multicollinearity test and a Chow test for regression stability through a simple, user-friendly interface. We’d love to hear your ideas and experience with NumXL and our support. To keep the reviews objective and let us truly assess where we stand in terms of service quality, we are asking you to leave anything special aside from from honest opinion of our product and services. Where can I submit reviews? You can leave your review at your favorite directory site: Google+, Amazon, Yelp, Yahoo, CNet, etc. Go to NumXL Google+ homepage. NumXL on steroids -- What are we working on next? As 2012 comes to an end, we are putting NumXL on a new development track and marching toward our next major release - NumXL 1.60 APACHE. More optimization, more statistical tests and more modeling! Spider Financial thrives to build the ideal tool for business practitioners, helping them extract results easily and rapidly as they examine ideas and identify model/data flaws. You can still continue to email us at support@spiderfinancial.com or helpdesk@spiderfinancial.com, and the request will be handled by the new portal. Finally, we integrated the live support (i.e. online chat), so when you click on “Ask Us” tab on the main website, you have more options (e.g. search the knowledge base, open a request form and start a live chat with a support personnel). We are really excited, and we thrive to provide best support service. But we can’t do it alone. Please, visit us at http://support.numxl.com and share with us your thoughts and suggestions. The new support platform replaces the current help desk and forums. We also completed a major structural revision of NumXL in preparation for future features, making the software even faster than earlier versions. In addition to numerous fixes, the new release will support 64-bit version of Microsoft Excel 2010 and 2013, making it easier to analyze large data sets into NumXL. The motivation for this new version came from our customers and the fact that 64-bit processors are quickly becoming the standard for many servers and desktop computers. We encourage anyone who is interested in joining the beta program to contact our beta support team at beta@numxl.com for information about the program, and instruction for downloading Numxl-beta. Check out the latest NumXL tutorials on our YouTube page. For more information on NumXL 1.58 BAJA, visit NumXL reference notes. [September 17th, 2012]: Today we are excited to announce the release of a new version of NumXL: 1.57 SINGA (1.57.41168.2). This new release includes several new features: support for U.S. Census X12-ARIMAi modeling and seasonal adjustment, kernel density estimates, statistics of fit and more. For a complete list of the changes, please refer to the NumXL release notes. [September 5,2012] This is our second issue of an ongoing series on select case studies. We'lli use real financial data to construct models with the help of NumXL. In this issue, we’ll examine the U.S. crude oil reserve stock level time series (i.e. crude oil inventories in the U.S. including the Strategic Petroleum Reserve (SPRi)). We will model the dynamics in the crude oil stockpile (including SPR) level over time and project a forecast for the next 12 months. Why do we care? The level of inventories helps investors estimate the prices for petroleum products (e.g. gasoline, heating oil, diesel, etc.). Like for other goods and services, prices for petroleum products are determined by supply and demand. [August 21,2012] This week, we present a first issue of an on-going series on select case studies. These select cases will utilize real-world examples and real financial data when applying the models and methods supported by NumXL. In this issue, we examine a claim by a portfolio manager (trader X) about his ability to generate an absolute return (i.e. alpha). Trader X agreed to share his monthly realized net returns history for our analysis. To achieve superior returns, professional managers in the financial market are constantly inventing new proprietary strategies. And they charge their clients a hefty fee for their professional advice. So before you hire any professional manager, it is pivotal for you to examine their track records (i.e. returns) and benchmark them against other managers or passive investment strategies (e.g. S&P 500, etc.) to justify his or her fees. We are excited to announce a couple of new developments on the NumXL support front: (1) We revamped the Getting Started user's guide, and (2) We are pooling all the NumXL tutorial videos and making them available on a single Youtube channel. Many of our users could not view the tutorial videos on their iPhone and/or iPad devices, while other users reported slow download times. To accommodate a broader pool of viewers, we converted our video format (and uploaded) everything to YouTube. You don’t have to do anything different than before: Just navigate to your NumXL web page of interest, and if a tutorial video is available, just click on the video thumbnail image. We are excited to announce a new development on the NumXL support front. We'lli be pooling external links and resources and posting them on our Facebook page. Many of our users requested links to resources and literature on time series and the different algorithms. You'll now have access to a whole range of time series bookmarks and resources. We will be adding more resources over time. [July 12,2012] This week, we’ll take the prior discussion further and develop an understanding of autoregressive conditional heteroskedasticity (ARCHi) volatility modeling. Volatility cannot be directly observed, and volatility modeling is more complicated than those of a conditional mean. The concepts and the ARCH model discussed here are pivotal to a solid understanding of financial time series volatility. [July 6,2012] This week, we continue our on-going series on volatility modeling and forecast. In this issue, we start by defining the various terms in an asset’s return time (e.g. holding period), and explain the multi-period forecast of returns and volatility. Finally, we define the different types of volatility terms (e.g. local volatility, term structure, long-run and forward volatility) that we will come across in our future volatility modeling. Why do we care? The concepts discussed here are pivotal to a solid understanding of financial time series volatility. The concepts are not unique to one model, but rather generic and applicable to the entire volatility modeling domain. [June 20, 2012] This week, we will show how to make a backward forecast using only NumXL functions in Excel. We will also discuss the relationship between a regular time series model and an implied backward/reversed time series model. Why do we care? Backward forecasting is a vital tool in time series analysis. For instance, we can apply it to fill-in missing values using both sides of the gap for imputation. In addition, backcasting allows the re-creation of historical events within a model, and thus, finding increasing applications in macroeconomic time series models. We are excited to announce a new development on the NumXL support front. We are pooling all the examples we have developed over the years and are making them available to our users via a cloud-based storage service (Box.net). You now have access to a whole range of examples. Each example comes with an elaborate description, so you can decide whether you need a certain example before you download it. In addition, this service is our central repository. We will be adding more examples as we develop them. You don’t have to do anything different than before: Just go to the reference manual on our website and navigate to any Function of interest. In the reference page, you will find a small window (toward the bottom of the page) listing files with examples. Hovering your mouse over a file or a folder in this window provides a unique description for it in a pop-up tip. Why don’t we bundle the examples with the installed software? The sheer size of the installer would grow dramatically, making it slower to download. In addition, the installed software will occupy a larger space on your computer, and you won’t have access to the newly added examples. [May 31th, 2012]: Today we are excited to announce the release of a new version of NumXL: 1.56 ZEBRA (1.56.41060.2). This new release includes several new features: date rolling and adjustment, U.S. and non-U.S based holidays support, non-western weekends, public and bank holiday calendars. For a complete list of the changes, please refer to the NumXL release notes. [May 30, 2012] Today, you may have experienced and/or reported a problem with the license key activation using the direct method. The SSL certificate for the web service has just expired, and License activation requests are being rejected. Not to worry, a new certificate has been issued and we will deploy it in the next 24 hours. Please accept our apologies for any inconvenience. We thank you for your patience with us. We truly appreciate it. [May 31,2012] This week, we go over time series smoothing functions, highlight its assumptions and parameters, and demonstrate its application through examples. Why should we care? Smoothing is very often used (and abused) in the industry to make a quick visual examination of the data properties (e.g. trend, seasonality, etc. ), fit in missing values, and conduct a quick out-of-sample forecast. In this issue, we will discuss five (5) different smoothing methods: weighted moving average (WMAi), simple exponential smoothing, double exponential smoothing, linear exponential smoothing, and triple exponential smoothing..
[May 17,2012] This week, we tackle the trend issue. No, we aren’t talking about the latest trend in technology or fashion; we’re talking about trend analysis for time series data! Disappointed? Don’t be, this is an exciting and fun topic. Put simply, trending is the practice of fitting a curve (e.g. line, polynomial, exponential, etc.) to your data over time, in an effort to project a forecast and establish a confidence interval. How does this relate to time series analysis?While the fitting curve is a function of time, the parameters of the curve were found using prior information and is thus related. Why should we care? The trend is very often used (or abused) in the industry to make a quick (and dirty) forecast. Executives might use the trending tool as a sanity check when he/she examines results from more advanced models. In this paper, we will go over the “NxTrend” built-in function that was first introduced in NumXL 1.55 (LYNX) and demonstrate, through numerous examples, its use and the intuition behind it. We will focus on the back testing aspect and the forecast confidence interval. [May 10,2012]This week, we dig deeper into the ARMAi stochastic process for the first entry in our "Unplugged" (or "Under the Hood") tutorial series. We've featured ARMA models in a few of our tutorials before, but this week we'lli explore them in rich detail, starting with a clear definition of the process and moving on from there. We'll take you through ARMA's underlying assumptions, exploring the role of innovations or shocks as they affect the overall ARMA machine. Finally, we take a close look at how an ARMA process produces a stationary time series with a stable, finite, long-run mean and variance. [May 2nd, 2012]: We are excited to announce today the launch of NumXL new release 1.54 RED (1.54.41030.1). The new release includes several new features: time series smoothing (e.g. Winter's triple exponential smoothing), data transformation functions (e.g. logit, probit, complementary log-log), robust descriptive statistics (e.g. MADi, MDi, RMDi, RMSi, Gini coefficient and Hurst exponent), and few minor fixes. For a complete lists of the changes, please refer to the NumXL release notes. This week, we take a look at a case inspired by a discussion in one of our online forums, which you can access at www.spiderfinancial.com/forums/financial-time-series/forex/. One of our users asked if they could use NumXL to predict the next-day market open and market close exchange rate (i.e. spot) for the EUR/USD. We started by creating a trading strategy where we buy EUR at market open, and close the position (selling EUR) at market close. Then we take a slightly different approach, avoiding the kind of complex non-linear models we would need to make sense of the noise-like distribution of the daily returns. Instead, we employ a stop-loss strategy that will limit our daily loss and, most importantly, generate positive returns. [April 25th, 2012]: We are excited to announce today the launch of NumXL release 1.53 SAC (1.53.41023.1). The new release includes several new features: time series smoothing, data transformation functions, and few minor fixes. For a complete lists of the changes, please refer to the NumXL release notes. We highly recommend our users to download and install this release. [April 24,2012] In this week's issue, the final entry in our series of data preparation tutorials, we discuss the influence of outliers on our time series analysis. Dealing with outliers can be tricky, as they might result from a number of factors, from simple data entry errors to influential an unexpected "black swan" events. In this tutorial, we discuss the problem of outliers, how to detect them, and what we can do with them. We start with a basic definition of outliers, which typically appear as a result of human error, instrument error or through natural deviations in populations. Then we explain a few means of testing for outliers and developing robust models capable of dealing with black swan events. [April 18,2012]This week, we continue with the fourth issue in our ongoing data preparation series by addressing two important anomalies commonly found in sample data: (1) concentration of values - either a tight range (e.g. proportions) or a wide dispersal over several order of magnitude (e.g. population, income, rainfall volume, etc. ), and (2) the mean/variance relationship. For this tutorial, we’ll start by going through a few different value concentration cases, explain their impact on analysis and forecast, and, finally, present common transformation methods and discuss concerns for mapping results from a transformed data scale back to raw data. Please note that the official support will be available only through our help-desk support system. To access and -hopefully- join the NumXL forums, please go to this page. [April 11,2012] This week, we unveil the third issue in our ongoing series of tutorials on data preparation. This time, our focus is another bedrock assumption in time series modeling: homogeneity, or the assumption that a time series sample is drawn from a stable/homogeneous process. We start by laying out a workable definition of a homogeneous stochastic process, then running through the minimum requirements for time series analysis. Then we'lli use sample data drawn from our previous tutorials to draw a few observations about homogeneity and examine the underlying assumptions behind them. Questions? Comments? We'd love to hear your ideas for future issues or feedback on past issues. Contact us at support@spiderfinancial.com. [April 7,2012] We've heard a few questions from many of our users about the new 7-day grace period offered with our latest NumXL release. Simply put, you can now run a full version of NumXL immediately for seven days, no license key required. Don't worry about entering a subscription key; all you need to do is open Excel and start using the Pro/Full mode of NumXL. Like what you see? After seven days you can keep working in Full mode by starting a free 30-day trial, or by downloading an annual or perpetual license key if you're full on board. Also, be sure to check out the NumXL release notes for more details on the newest features. [April 5,2012] Today we launch the second tutorial in our ongoing series about data preparation in time series analysis. Our focus this time around is one of the most fundamental assumptions in time series analysis: Stationarity, or the assumption that a data sample is drawn from a stationary process. First, we lay down a bedrock definition of stationarity and demonstrate the minimum requirements for stationarity in our time series analysis. Then we'lli tackle a time series data sample - namely the closing prices for IBM stock from January 3rd, 2012 to the present date - which we'll use to develop some observations about stationary processes, and explore the underlying intuitions behind them. [April 1,2012] Today, the SPIDER team announces the launch of an annual licensing (aka subscription) program for NumXL 1.5X Pro. New customers can now choose between the perpetual licensing plan and an annual licensing subscription at a lower cost. Like the perpetual license, the annual license includes FREE 12-month premier support and updates, and the same discounting for volume, non-profit, government and academic organizations. On a separate note, the SPIDER team has discontinued the promotional NumXL pricing campaign ($200), which we launched back in October of 2011. Please note that Customers who started their NumXL trial in the last two months (February and March 2012) can still purchase NumXL Pro (perpetual license) at the promotional price ($200) to the end April, 2012. Contact our customer support for further details. An annual subscription of NumXL is available at a base price of $150/user/year, while the perpetual license is available for $300/user. [March 29,2012] This issue is the first in a series of articles that explore the data preparation aspect of time series analysis. Data preparation is often overlooked by analysts, but we believe it is a vital phase that wields a vast influence on the overall analysis and modeling process. The vast majority of time series and econometric theories assume input time series to be stationary and homogenous, with equally-spaced observations and values that are present and real. In practice, we often handle samples with missing values, unequally-spaced observations possible outliers, mean/variance dependency, restricted values ranges and other phenomena. The aim of this series of articles is to address each of these problems and introduce practical methods to overcome them. In this issue, we start with the sampling assumptions of the time series: equal spacing and completeness. Then we consider a time series with missing values and discuss how to represent them in Excel, with the aid of NumXL processing. Finally, we look at unequally-spaced time series, how they come into existence, how they are related to the missing values scenario, and what to do with them. March 15th, 2012 This week, we focus our attention to your burning questions about goodness-of-fit functions, like: What are the different functions for goodness of fit? How does each function differ from the rest? Which one do I use, and for what purpose? Put simply, A goodness-of-fit function is a quantitative measure of the discrepancy (or the agreement) between the observed values and the values expected under a model in question. In general, a measure of goodness of fit helps us to find good (or optimal) values for a model's coefficients and facilitate the comparison of competing models in an effort to select the best one. In this tutorial, we’ll start with the log-likelihood function (LLFi), and then expand to cover other derivative measures (e.g. Akaike's Information Criterion (AICi) and Bayesian/Schwarz Information Criterion (BICi/SICi/SBCi)). For an example, we use the time series of the ozone levels in downtown Los Angeles for the period between January 1955 and December 1972. The exercise will leave you with a thorough understanding of goodness of fit, while demonstrating how NumXL can help you find an ideal model for your data. March 8th, 2012: In our continuous effort to make NumXL easy to use, we have created a tutorial video for our latest Tips and Hints Issue: ARCH Test Explained. In this video, we follow the workbook step-by-step, and help you better understand how to do an ARCH Test using NumXL. On a separate note, we have also launched a NumXL channel @YouTube, with demos and tutorial videos. please visit us there. March 7th, 2012 In this week's issue of Tips & Tricks, we use the NumXL package to explain a common - and commonly misunderstood - diagnostic in econometric and time series analysis: the Auto Regressive Conditional Heteroskedacity test, or ARCH test for short. As we will show, the ARCH test is essentially a tool for detecting non-linear autocorrelation in the time series. To illustrate this, we will use the time series of the IBM stock prices in the period between May 17, 1961 and November 2nd, 1962. We will then use the ARCH test to detect a time varying phenomenon in the conditional volatility, and, in effect, help us to select different models to capture these dynamics. The exercise highlights the ARCH test's utility as a tool for examining the time dynamics of the second moment, and will serve as a useful introduction to the ARCH Test function in NumXL. February 29, 2012:In this week's issue of Tips & Tricks, we use the NumXL package to demystify the normality test, a common diagnostic tool in econometric and time series analysis. Using the Analysis Pack Add-in in Excel, we generate 5 series of random numbers, each from a different distribution. Then we apply three major normality tests - the Jarque-Bera, the Shapiro-Wilk and the Anderson-Darling - to examine the sensitivity of each test in detecting deviation from normality for different sample sizes. The exercise highlights the pros and cons of each test, and provides a useful introduction to using the Normality Test function in NumXL. February 22, 2012: In this week's issue of Tips & Tricks, we consider the process of models comparison, as well as the the selection of the best model. Using a monthly total sales time series for Company X, we conduct our preparatory analysis and propose several ARMAi models. Using a brute force approach, we examine every candidate model, calibrate its parameters and validate the underlying model assumption(s). Your objective will be to compare the (surviving) models and choose the best candidate. For details, or to download the document and/or the spreadsheet for this tutorial, go to "Sales Forecast Example - Models comparison and selection" on our website. The international airline passenger series documents the monthly totals of airline passengers between Jan 1949 and Dec 1960. Our objective with this exercise is to follow the same analysis found in Time Series, and to demonstrate the accuracy of NumXL calculations. Furthermore, a leading statistical software vendor - SAS - presents its own analysis for the same data set, so we strongly recommend that our users review the analysis on the SAS support site as well. For details, or to download the document and/or spreadsheet for this tutorial, go to "Text Book Example - Airline passenger data" on our website. February 9, 2012: This week, the "Tips & Tricks" newsletter tackles the issue of the volatility forecast using GARCHi Modeling techniques. Starting with S&P 500 ETFi monthly prices, the paper illustrates the few steps it takes to process the raw data; specify a model; fit or to calibrate the the model coefficients values; validate the assumptions of underlying model; and, finally, to construct a 12-month volatility forecast. 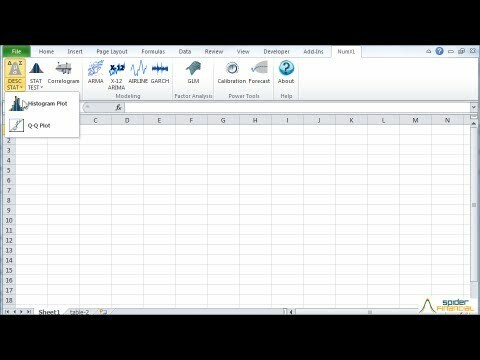 We did all of the steps using NumXL, right in Excel. For details or to download the document and/or the spreadsheet for this tutorial, go to tips NumXL Cookbook: Volatility Forecast with GARCH on our website. January 27, 2012: In the next couple of weeks, expect some exciting enhancements to NumXL! We are adding support for three frequently-requested time series models: ARIMAi, ARFIMAi and SARIMAi. We are constantly working on improving our product, and continuing to use your feedback as a key component of our efforts here. Please keep your comments coming! Thank you for support and stay tuned. January 26th, 2012: We are excited to announce today the launch of NumXL release 1.52 (1.52.40934.5). The new release is updated according to the suggestions from customers including: improved functionality and usability for the Generalized Linear Model (GLM), and a few more miscellaneous fixes/enhancement. For a complete lists of the changes, please refer to the NumXL release notes. January 17th,2012 : Several users with Spanish version of Excel reported issues with the formulas generated by NumXL Wizard. The issues are due primarily to the locale or regional settings (e.g. decimal point interpretation). Going forward, Our Team is working to resolve those issues as high priority, and a new release is scheduled in the very near future. December 28, 2011: The SpiderXL Team released a new maintenance patch (III) for NumXL 1.51 ORB (1.51.40905.1). This release is a hot fix for the Airline model forecasting function. We strongly recommend our users to download and install the latest NumXL release. December 21, 2011: The SpiderXL Team is pleased to announce a new and more robust help desk support option for our users. This will help with easier maintenance and support for bugs for all of our products, feature/enhancement requests, general support requests, and more. The help desk is available 24/7/365. No account is needed when creating tickets, all you need is your email. November 11, 2011: The SpiderXL Team release a new maintenance patch for NumXL 1.51 ORB. The released addresses the problems experienced by few users while activating their keys. October 3, 2011: We are pleased to announce a new promotional price for NumXL - originally $300, it is now available for a limited time for only $200. Volume pricing has also been adjusted to reflect the new price. We are working diligently to release the highly anticipated NumXL 2.0 (Black Widow), after which NumXL will be available at the original (non-promotional) price. Please, keep in mind, all purchases come with a free upgrade for a full 12 months, so customers who purchase NumXL 1.51 (ORB) now are entitled for a free upgrade to NumXL 2.0! With those three pieces, your activation code will be immediately given to you. You will be able to activate within minutes, without needing to contact our support team to get the activation code. It is available every day, all day. Use the online manual activation here. August 18th, 2011: We are happy to announce the launch of a special discount offer exclusive for students and/or parents shopping for students. Through this program, students are entitled to a deeply discounted copy of NumXL for only $50. To qualify for this sale, simply email us at sales@spiderfinancial.com from your valid “.edu” e-mail account, and we will send you the promotion code to use at our online checkout store. If you do not have an .edu address, please contact one of our sales representative at 1 888-427-9486. 10-29-2010: Over the past week, we moved our web-site to a dedicated server to improve overall performance. During this transition, users may have experienced and/or reported a problem with the license key activation using the direct method. We have identified the issue and corrected it. Please accept our apologies for any inconvenience. We thank you for your patience with us. We truly appreciate it. A compile error message that pops up for Excel 2002 (XP) users. For a full list of changes in this release, please check out the NumXL change log. Users who would like to use Excel 2010 or 2002 (XP) with NumXL should download and reinstall NumXL 1.0 from our website. This new version will automatically include SP3. Excel 2010 is not supported in the current NumXL 1.0 installation program, which was written before Excel 2010 was officially released. You will see an error message when you try to install NumXL 1.0 under Excel 2010 - we are working on the upgraded installation program as you read this and we will be able to release the upgrade in the next week for all of you who want to use NumXL 1.0 with Excel 2010. The NumXL 2.0 Beta program will be available for download in one to two more weeks. For the moment, we are putting together our NumXl 2.0 Beta testing team list and we are asking our most motivated users to review our Beta Testing Agreement and contact us at beta@spiderfinancial.com indicating your willingness to join the NumXL 2.0 Beta Testing Team. You will then be notified when the Beta version of NumXL 2.0 becomes available for download in the next two weeks. In a constant effort to improve solution quality and response time regarding user issues, we have added a new service to our live support - on demand remote desktop support. On demand remote desktop is a remote support tool that enables instant, secure, and trouble-free connections between remote computers over the web and to any point on the globe. Using state-of-the-art software from TechInline, our support team can quickly view, diagnose, and fix issues related to our products on your remote desktop without pre-installing software. Although, NumXL 2.0 is not officially out, this article will give you a good head start on the new features in NumXL 2.0. Furthermore, the functionality offered through the menus, tool-bars and form wizards has been revised to enhance the usability of both the existing and new functions. We are excited to announce the launch of our newly-updated website. The new site includes a few new functionality features (e.g. Live Support) and enhances access to product information, support and resources. A clearer structure, simplified navigation and improved search functions make finding answers and information easier than before. If you experience any problems using the new website, or if you have any suggestions, please contact us at webmaster@spiderfinancial.com. NumXL 2.0 (Beta) will be further delayed to address a few issues raised during our preliminary tests and to add new advanced models (e.g. ARFIMA, IGARCH, etc). The delay will allow our engineers to continue working on those enhancement and to apply patches for all known problems. Fortunately, there are no relatively big new issues, so it should be a short delay. Tentatively, we are looking at the third week of March 2010 for a release date. We are actively working on the second maintenance release of NumXL 1.0. The new release includes several important fixes for reported issues, new functions, and few minor function enhancements. For a complete list of changes, please visit the NumXL change-log page. The new release will be posted online by the end of January 26th, 2010 (GMT-6). We recommend all users to download this update for the fixes included. A new version of NumXL 1.5 with full-support to license keys is available online. The new edition includes no code changes, and it is introduced primarily to unlock the professional-only functions during the 30-day trial period. After the end of the trial period, NumXL will revert to the Lite (freeware) mode. We are actively working on the second major release of NumXL. The plans for NumXL 2.0 were driven primarily by the large amount of feedback we received from our users. In this coming edition, there will inevitably be a few changes despite our relentless attempts to keep the functions set static. We are hoping that the simplicity and added functions in the new version will offset any inconvenience experienced by our users. Tentatively, we are planning to have our first release of NumXL for beta users early in January 2010. NumXL 1.0 will be delayed to iron out issues detected at the last moment. The delay will allow our engineers to continue working on those issues and to apply patches for other known problems. Fortunately, there are no relatively big new issues, so it should be a short delay. Tentatively, we are looking at the end of September 2009 for a release date. [August 12th, 2009] NumXL - the econometrics analytics software - is currently under active development in preparation for its official Release on September 7th, 2009. The latest release includes a few minor fixes, revised documentation (i.e. help file, tutorials, and case studies) and enhanced user-interfaces (UI), improving the usability of the software. To see a full list of changes in this release, please check the release notes. The official release will be available for download on September 7th. We recommend all users download this update for the minor fixes included. You can download and install NumXL 1.0 at the NumXL 1.0 Download site. NumXL - the econometrics analytics software - is currently under active development in preparation for its RC Release on July 24th, 2009. Although the new release includes few minor fixes, we have redesigned its documentation (i.e. help file, tutorials, and case studies) and made available an extensive set of user-interfaces (UI), natively improving the usability of the software. To see a full list of changes in this release, please check the release notes. The RC release will be available for download on July 24th. We recommend all users download this update for the minor fixes included. You can download and install NumXL 1.0 RC at the NumXL 1.0 Download site. The NumXL is released under freeware license agreement. Users are advised to review the license agreement. The optimal trading strategy is to buy low and sell high. This is easier said than done, and many of us invest lot of effort experimenting with strategies in an attempt to get closer to this end. In this paper, we construct this hypothetical optimal strategy, analyze its returns and construct an econometric model to capture its time dynamics. Next, using the model, we forecast the conditional returns and compare them with returns of actual strategies. Finally, we discuss their application in stop-loss optimization for actual trading strategies. The white-paper and the supporting financial model are available on our website to all our registered users. Exchange-listed futures are increasingly used in active strategies; they offer leverage, efficient access to illiquid physical markets, and risk management tools. In this paper, we illustrate the issues and procedure related to incorporating futures in our strategy (e.g. Contract specifications, Margin requirement, contract size, leverage, mark-to-market (MTM) etc.). We define returns on margin and closely examine the P&L draw throughout the day. The white-paper and the supporting financial model are available on our website to all of our registered users. Developing a trading strategy is an iterative process; it begins with forming few trading ideas, back-testing, and drawing conclusions or forming new ideas and starting over. This paper discusses the back-testing process of the strategy; we demonstrate the steps, issues and assumptions made during the preparation of the data sample and the calculation of the hypothesized strategy's returns. Finally, we turn our attention to risk aspect of the strategy and its application within an established trading environment with common risk management policies.